From #Gamergate to the 2016 election, to the daily experiences of marginalized perspectives, gaming is entangled with mainstream cultures of systematic exploitation and oppression. 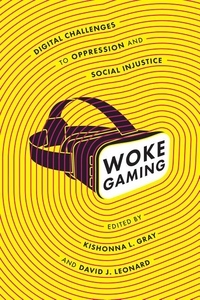 Whether visible in the persistent color line that shapes the production, dissemination, and legitimization of dominant stereotypes within the industry itself, or in the dehumanizing representations often found within game spaces, many video games perpetuate injustice and mirror the inequities and violence that permeate society as a whole. Drawing from groundbreaking research on counter and oppositional gaming and from popular games such as World of Warcraft and Tomb Raider, Woke Gaming examines resistance to problematic spaces of violence, discrimination, and microaggressions in gaming culture. The contributors of these essays seek to identify strategies to detox gaming culture and orient players and gamers toward progressive ends. From Anna Anthropy's Keep Me Occupied to Momo Pixel's Hair Nah, video games can reveal the power and potential for marginalized communities to resist, and otherwise challenge dehumanizing representations inside and outside of game spaces. In a moment of #MeToo, #BlackLivesMatter, and efforts to transform current political realities, Woke Gaming illustrates the power and potential of video games to foster change and become a catalyst for social justice.